Thoughts and ideas on innovation execution, with a dash of strategy and leadership thinking. The Olympics are always inspiring with the amazing results achieved by the competing athletes. It’s easy to look at someone like Michael Phelps and decide that he provides no inspiration for the average person because he has been groomed for over a decade to excel at this event due to his extraordinary natural talent–and the reality is that yes he has. If you resonate at your job, ring it as hard as humanly possible. I am constantly amazed at talented people who have the ability to do great things in their professions…yet they don’t achieve greatness because they treat their job like the average job that they’ve been taught to expect: working nine-to-five (well, nine-to-six is the norm these days) and only do what they are asked to do. Finding what you are good at and working as hard as you can at that is, frankly, a luxury that most people don’t have. Most people aren’t able to spend their salaried time doing what they do well—most people just work to make a living no matter what the job. Being paid to do what you do well is an opportunity that perhaps one can only truly appreciate at the end of one’s career—to be thankful for being paid to be best at exactly what one is in fact best at. The satisfaction of this unique situation is not about being paid for it, of course; it’s about being judged at what one does best and being given the opportunity to excel at what one does best. If one takes that opportunity, that is. That opportunity, of course, defines the lives of Olympic athletes. And nothing defines them more than matching their talents to their training and working as hard as they can to be best as they can. In the spectacular finish of the American 400m freestyle relay, the finish of Jason Lezak was spectacular: his performance seemingly pre-destined for the history books, and an achievement celebrated worldwide. Yet what’s not seen nor appreciated by the Olympics viewers is the incredible—and I mean incredible beyond what most people can ever imagine—incredible work ethic that Lezak executed to put himself in the position to be able to make one of the most amazing comebacks ever. The brick walls are there for a reason. The brick walls are not there to keep us out; the brick walls are there to give us a chance to show how badly we want something. The brick walls are there to stop the people who don’t want it badly enough. They are there to stop the other people! Work hard. Work harder than others. Work hardest if you are really good at it. Challenges simply exist for you to overcome then if you are up to it. Most people complain about their jobs and the perceived difficulties and obstacles that they experience. This tip is for the few of you who want to be able to look back on your career with sanguine satisfaction rather than a melancholy attitude towards all that you simply put up with: the brick wall is there for a reason, so let your colleagues complain about it while you scale it, put it behind you, and face new challenges that few ever progress far enough to even come up against. To most people in the country, I suspect, the only impact of this statement is an impression of the passing of another sports name, perhaps sports legend, who will eventually be replaced in the public’s eye with the next big-name coach at a big-name university. Bo was more than that. Bo represented the spirit of a school, if not a whole state, in his embodiment of integrity, determination, team-orientation. 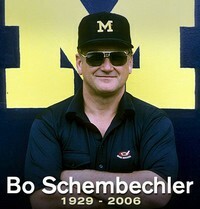 Bo was the face of what many Michigan students hoped to one day achieve: overwhelming success without compromise, determination to succeed while maintaining absolute standards of conduct. Bo was determined in what defined success—a Big 10 championship—and in what was necessary to be successful—sacrifice for the success of the team. Bo wasn’t just a faceless coach who answered questions with pre-canned statements that we’ve heard thousands of times.The press loved him because he was as consistently honest with them as he was with anyone whom he met. To many who weren’t used to hearing honest thoughts from a player or coach, Bo seemed like an oddball. To those who actually listened to what Bo had to say, he was inspiring. A close friend of mine, a professor who only ever observed Bo from thousands of miles away, liked to make fun of Bo by mangling his surname and mocking his sometimes over-the-top press conferences. Similarly, academicians in general tend to dismiss sports and sports personalities as being trivial and insignificant. A professor at Michigan liked to recount how a dean at Michigan once told him that the worst thing that ever happened to the University of Michigan was that it had a great football team because that took focus away from the school’s excellence in academics (Michigan often vies academically with Berkeley for top state univerisity honors). What all of these people don’t recognize is the importance of characteristics embodied by people like Bo. There’s a reason that sports metaphors are often applied to other fields of endeavor—they embody behavior and characteristics that are valuable in many areas outside of the sports arena. Are the great achievers in Silicon Valley more similar to towering sports coaches or to brilliant lone scientists? Are Steve Jobs, Bill Gates (okay, not Silicon Valley), Andy Grove, Larry Ellison better associated with the successful engineering professors or with successful coachs? Bo was passionate about his job and inspired others to be passionate as well. So do the great entrepreneurs in Silicon Valley. Many Michigan alum, who observed Bo’s determination with uncompromising standards, unconsciously try to embody Bo’s values in their lives today, no matter what profession they are in. Great leaders embody those same characteristics that were so abundant in Bo, although most leaders rarely experience the same public scrutiny, pressure and expectations. To those who were at Michigan during Bo’s tenure, his passing seems like a weakening of life’s foundation—one can’t imagine Michigan and Bo not co-existing. More importantly, the ideals that he represented have lost a steadfast representative. I have to admit, after today, the phrase “Go Blue” for me won’t carry as much weight as it used to. I heard a great interview last week on NPR with Justin Wolfers, a professor at the Wharton School of Business. The story was also covered by papers such as the San Jose Mercury News. Wolfers has done statistical research that concludes at least approximately 500 games in NCAA basketball over the past 16 years have involved point-shaving: 6% of games with strong favorites which represents 1% of all games. I like his application of simple mathematics to analyze something that everyone can understand, and I also like the name for the field of this application: forensic mathematics. Wolfers analyzed the game scores of tens of thousands of NCAA division I games and compared their point difference to the Vegas’ betting line for those games. He discovered, in a way that can only be done with a huge set of data, that the games in which one team was favored by over 12 points had a statistically significant anomaly in the distribution of difference in points scored, indicative of point-shaving. Point-shaving is where a key team member plays poorer so that their team’s score is on the lower-side of the Vegas odds, but typically not so much that his team loses. This is most easily done by a key contributor to a dominant team in a game that is expected to win by a large score: that key player could turn over the ball a couple of times or clunk a few shots off the rim near the end of a game where they will clearly win. For example, a player ensures that they only win the game by 10 points when the Vegas spread had then winning by at least 12 points. How can statistics tell whether such a thing happened? By looking at conditional probabilities. Wolfers looked at the final point spread in games where the predicted spread was 12 points or more and found that the winning team scored less than predicted. The obvious skepticisms to this are: (i) maybe Vegas was wrong, and the betting line typically over-estimates the spread in lopsided match-ups, or (ii) maybe the overwhelming favorites tend to not play as hard when they are the clearly dominant team so they tend not to score as much as expected. Wolfers raised these reasonable objections in the NPR interview and explained how his analysis avoided these possibilities, but I’m guessing that his quick verbal explanation wasn’t so clear to NPR listeners, so I’m going to provide a visual of what he found. Wolfers looked at the distributions of game score differences conditioned on the predicted Vegas spread. The figures at the right are my representations of distributions for three different hypotheses. Figure B in the center shows what such a distribution probably looks like if the predicted spread of 12 points was accurate on average. The Central Limit Theorem tells us that this distribution will be Gaussian if the individual points scored are independent samples with equal probability distributions–certainly not true but perhaps not an unreasonable assumption. In this case, the Vegas adds were accurate, and the same number of games that had point differences above 12 points equaled the number of games that had point differences below 12 points. Figure A at the top shows what this distribution would look like if Vegas tended to over-estimate the point spread for these games, or if the favored teams tended to slack off when the spread is this high and under-achieve. The distribution is approximately the same shape as Figure B, but shifted to the left. Figure C at the bottom shows what you would expect if favored teams cut a few points out of their win when the game is close to the spread: the number of games that barely beat the spread would be lower than expected and the number of games that barely missed the spread would be greater than expected. The distribution found by Wolfers for lopsided games resembled Figure C.
The mathematical analysis isn’t too rigorous but is compelling nonetheless. What does this all mean? Point shaving probably occurs in NCAA basketball more than some of us thought. More importantly, however, if you are going to bet on a game with a large point spread, bet against the spread!